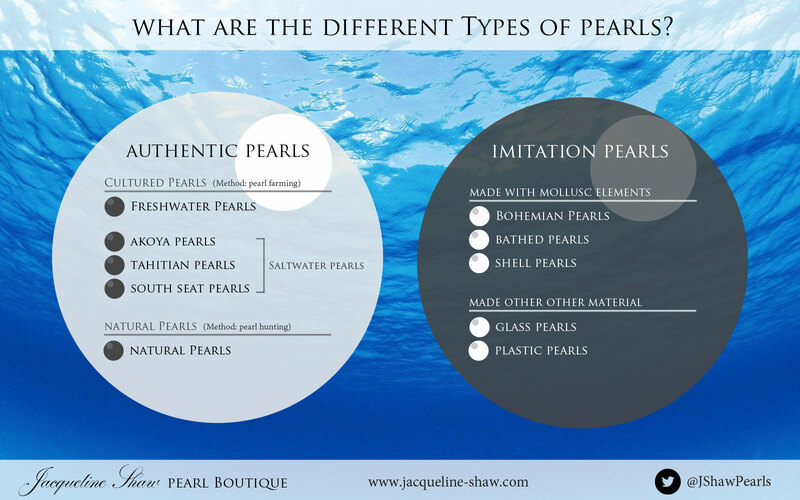 For those with new interest in pearls it can be a little confusing getting to understand all the terms, so here's an info-graphic for the perplexed, and please read on for detailed explanations. There are two basic categories of pearls, those that are authentic and formed naturally within a living shell mollusc, and those that are imitation pearls, made with a variety of methods and materials. Within the authentic pearl category, there are two types: cultured pearls – which are formed within molluscs via human intervention; or natural pearls – that have formed under natural circumstances and obtained by pearl hunting divers. Japanese entrepreneur, Mikimoto, invented pearl culturing in 1893. This revolutionary step completely changed the landscape of pearl jewellery. Originally only accessible for those with great fortunes, authentic pearls are now a possibility for most. Freshwater pearls are farmed with molluscs living in lakes, ponds or rivers. A mollusc is able to produce up to 50 pearls at a time, although 26 – 34 are typical yield numbers. Cultured freshwater pearls are usually grown by inserting tissue into the mollusc, meaning that most of them don't have a nucleus, and are almost pure nacre. This is in contrast to saltwater pearls that contain a bead. Freshwater pearl jewellery is the most popular type thanks to affordability in comparison to cultured saltwater pearls and natural pearls. Freshwater pearls form an important part of high street fashion, especially in UK and Europe and USA. Saltwater pearls are cultured with molluscs living in seawater. In appearance Freshwater pearls are noted for a softer lustre, a glow that comes from deep within the pearl. Saltwater pearls such as Akoya pearls have a more brilliant, almost mirror like lustre. The difference is due to the type of mollusc that produces the pearls and the difference in thickness of the nacre. Saltwater pearls are in general much larger than freshwater pearls, thanks to the pre-inserted nucleus. The growing time for Saltwater Pearls take between 6 to 18 months - the slower the growing period the better as the nacre is smoother and even - but the longer the pearl is grown in the ocean the higher risk of damage, storms, mollusk dying, etc - so the price for saltwater pearls will fluctuate enormously with the thickness of nacre and the risk taken. Akoya pearls are mainly grown in Japan, within the Akoya mollusk (Pinctada fucata). Tahitian pearls are always black, so the term is also used to refer to black pearls, grown from the black lip oyster (Pinctada margaritifera). They are mainly cultivated in the French Polynesia, around Tahiti. South Sea pearls are golden saltwater pearls cultured from golden-lipped oyster (that can also produce highly luminescent white pearls), found mostly around the warm waters of South East Asia. The special golden colours are formed thanks to the tropical oceanic climate. Natural pearls occur spontaneously in wild molluscs either in freshwater or saltwater. They are extremely rare and were the only type of pearls available as gemstones up until late 19 th century, when Mikimoto invented pearl culturing. Natural pearls come in all different forms and shapes, with the round ones being considerably rarer than those occurring in cultured pearls, as there is no control over the pearl shape in nature so the round form would come through pure chance. Natural pearls are so high in value that, In 1917, jeweller Pierre Cartier purchased the Fifth Avenue mansion (now the New York Cartier store) in exchange for a matched double strand of natural pearls that he had been collecting for years. At the time, these pearls were valued at $1 million USD. Imitation pearls are man-made beads that are designed to resemble real pearls. They are also referred to as faux pearls. Bohemian pearl: cut and buffed mother-of-pearl protuberance. Closest form of imitation pearls to real pearls. Bathed pearls (also called "improved cultured pearl"): a mother-of-pearl core coated with a mixture of plastic enamel, lead carbonate, mica, and titanium dioxide, then with a film of iridescent nylon. Shell pearls: also know as Mother-of-pearl pearls. They are made with crushed nacreous shell powder, sintered into the desired shape. This method produces pearls with high resemblance to real pearls, as the same mollusc material is used, however you can still tell the difference with a close look. Glass pearls: glass bead dipped or sprayed with pearlescent material, or hollow glass bead filled with pearlescent material. A variation is called Majorcan pearl. Wax-filled pearl simulants are hollow glass beads coated with essence d'orient and filled with wax. Variations of these wax-filled simulants, which are produced in slightly different manners, include Parisian pearls, Paris pearls, French pearls, Bourguignon pearls and Venetian pearls. Plastic pearls: plastic core coated with pearlescent material. This method produces the least realistic type of pearls, as the weight, touch and shine don't resemble real pearls. Plastic pearls tend to be lighter and not cold to the first touch like real pearls. However this is the cheapest form of imitation pearls, and very popular in cheap accessories, ornaments on clothing or in house decorations and art objects. Some forms of imitation pearls are produced to very high quality, and actually cost more than authentic freshwater pearls.